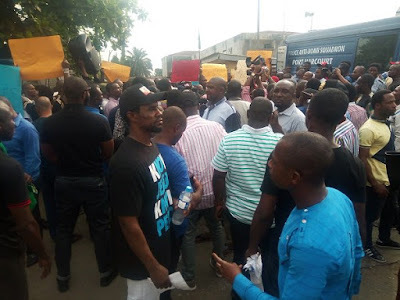 Thousands of protesting members of the All Progressives Congress (APC) in Rivers State, from 8 a.m. today, blocked the main entrance of Rivers headquarters of the Independent National Electoral Commission (INEC) on Aba Road in Port Harcourt, insisting that the electoral commission must obey the ruling of Court of Appeal, Port Harcourt and relist the main opposition party in the state (APC) and its candidates. The aggrieved protesters, who were armed with placards bearing various inscriptions and chanting: “No APC, no elections in Rivers State,” were led by the party’s candidate for Rivers Southeast Senatorial District, Oji Ngofa, who is Nigeria’s Ambassador to The Netherlands. INEC’s Head of Voter Education and Publicity, Mr. Edwin Enabor, addressed the protesters and he informed them that the Resident Electoral Commission (REC) in Rivers, Mr. Obo Effanga, had not got to the office. Ngofa, however, insisted that he and other APC members would not leave, until their protest letter was personally handed over to the REC of INEC in Rivers, for onward transmission to the National Chairman of INEC, Prof. Mahmood Yakubu. The protesters were still in front of INEC office, with the gate still blocked, as at press time.